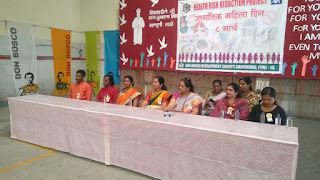 15-March-2019, Chinchwad (Pune): The Don Bosco Development Society (DBDS), Chinchwad celebrated International Women’s Day on 15-March at Don Bosco premises in Chinchwad. About 250 women participated in this programme held under the aegis of ‘AXA health risk reduction project’ supported by AXA business services. The programme was graced by: Advocate Vaishali Kalbhor (Ward Counsellor), Dr Menakshi Suryavanshi (Principal-Geetamata School), Ms Manisha Habane (SP-Traffic Police), Ms Vaishali Maharkar (Associate Manager-Accenture), Ms Sayantani Deb (Team Lead –Accenture) and Br Damodar Wankhede (Principal-Don Bosco Institute). The guests inaugurated the programme by lighting the lamp. This was followed by a silent play by the students of Don Bosco ITI on ‘Beti Bachao and Beti Padao’. Br Damodar shared his views on the need for women to take up technical and industrial training for their empowerment. This was followed with the felicitation of the successful women entrepreneurs who started their business after getting trained under this project. The women entrepreneurs also shared their experiences and success stories with the audience. This was followed by the keynote address by the guests. Advocate Vaishali spoke on the topic of ‘modern women’ and touched upon how the women are getting into new ventures and creating their place in this society. Dr Menakshi spoke on the topic of education and changing value system. She highlighted the role of parents especially mother in gender equality and safety of girls in society. The students of ‘tailoring’ classes enthralled the audience with their catwalk. The programme ended with the vote of thanks by the staff and snacks were served to all.